High school: Graduated from ‘St. Cyril and St. Methodius High School’, Simitli, in 2008. At present: Student at Sofia University ‘St. 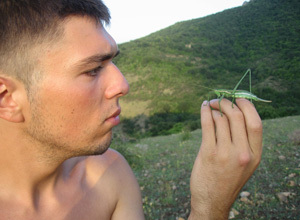 Kliment Ohridski’, Faculty of Biology, degree program Ecology and Environmental Protection. Qualifications: Driver, cat. B, M.
Interests: Computer systems and technologies, renewable energy sources, design. Hobby: Photography, walking among nature, listening to music. Love: Cats, homeland, art in all its forms, graphities. Dislike: Annoying, silly and unprepared people, alcohol, cigarettes, NONecological thinking. Why did I become an intern at the NMNHS? — Because I like this job and the team and it’s interesting.